There is now a new extension to the RFM69 library. 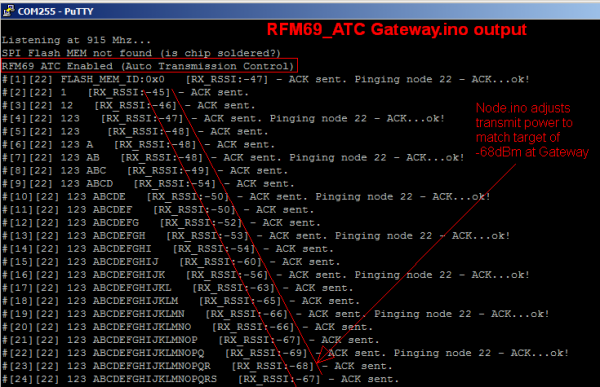 It’s called RFM69_ATC aka Automatic Transmission Control. Many thanks to Tom Studwell who implemented this and shared it in the forum. The basic idea behind this extension is to allow your nodes to dial down transmission power based on the received signal strength indicator (RSSI). For instance a sleepy battery node like a MotionMote sits still inside the home and usually has a very strong received signal, somewhere in the range of -30 to -40dBm when transmitting at full power. You could manually tune that down using radio.setPowerLevel(..) in code but its tedious and is a static change, if you move the node or conditions change it will not be smart to adjust the power level to the new environment. However with RFM69_ATC this is done automatically for you, you just need to indicate a target RSSI. On each packet sent and ACK received (using sendWithRetry(…) is required), the node analyzes the actual RSSI and continuously adjusts its own transmission power level of the RFM69 transceiver to attempt to match the target RSSI (+ or -). More details at LowPowerLab blog. This entry was posted on Thursday, November 12th, 2015 at 2:29 am	and is filed under library. You can follow any responses to this entry through the RSS 2.0 feed. You can skip to the end and leave a response. Pinging is currently not allowed.